The name cedar is used for many different trees around the world. The general consensus is that mostly these trees have scented wood similar to that of the true cedars. The true cedars we will discuss here are the four members in the genus Cedrus. All of which are evergreen conifers. Other so-called cedars include the Pencil cedar (a Juniper), and Red cedar (a Thuja) both from North America; and White cedar (another Thuja) from Japan. 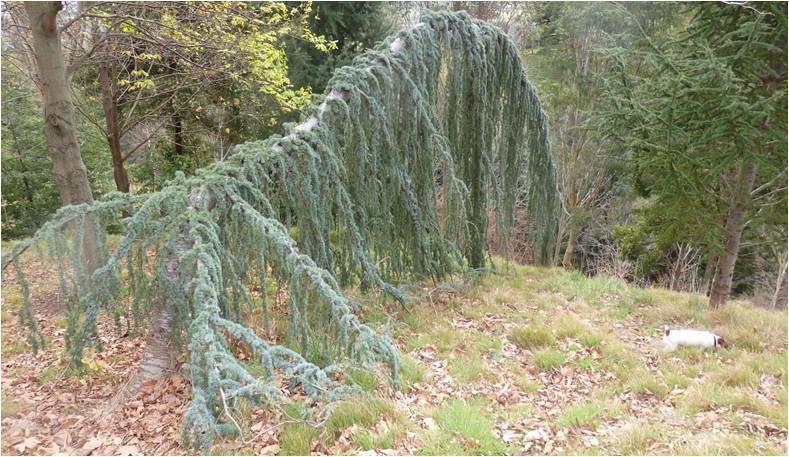 There is also an oddity that is deciduous from China called the Toon tree or Chinese cedar. There are others and I think this clearly illustrates why we are so fortunate to have only one different name [albeit in Latin] for every plant in the world! Back to the true cedars. These are distinguished by the arrangement of the needles on their young shoots. At the very end of young shoots the needles are arranged singly, but slightly further up on older wood the needles are in clusters of 30 to 40. They also have large barrel shaped cones up to 10cm high sitting on top of the branches, which are a giveaway to recognising these trees in many parks. The three species that can be seen around the country are: 1. 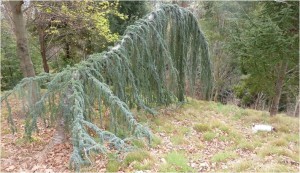 The Atlas or Atlantic Cedar [Cedrus atlantica ] from the mountains in Algeria and Morocco, 2. The Lebanon Cedar [Cedrus libani] from eastern Mediterranean, Lebanon and Syria, 3. The Deodar Cedar or Deodar [Cedrus deodara] Himalaya across to west Nepal. 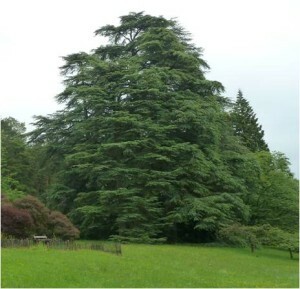 The Lebanese cedar was the first to be introduced into Europe as an ornamental in the late 1600s and the others in the early Victorian era. As hardy and handsome large trees, they gradually found their way around the world and feature in many large gardens and parks. The Atlas and Lebanon are not easily distinguished, and detailed examination of seeds and cones is often the most accurate diagnosis. Deodar, with its longer needles and drooping tips to the branches, is more easily recognisable. 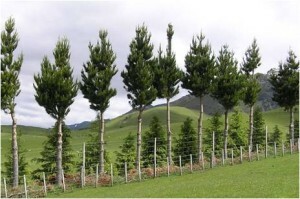 The latter is also more commonly planted and makes an excellent shelter or specimen tree on dry country. 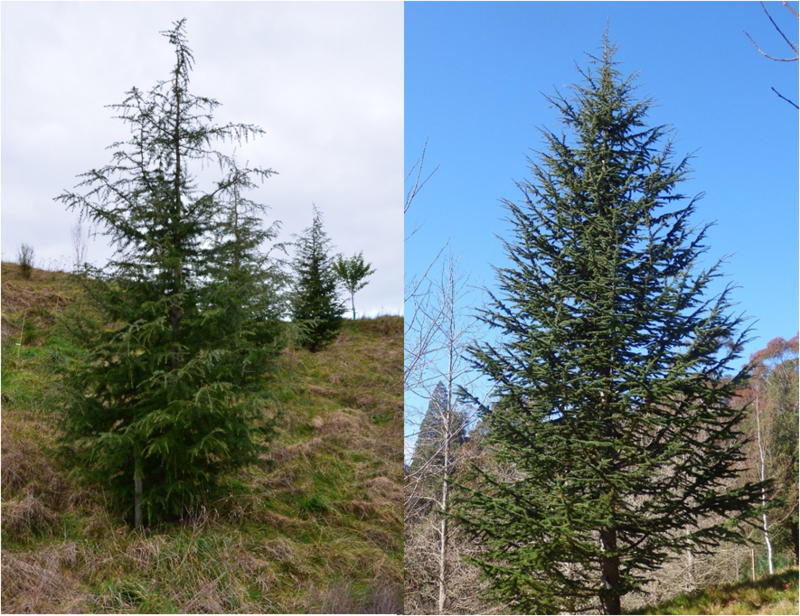 Because of the variation in growth form due to site and age, these trees are not always the easiest to identify from each other but you should be able to say with conviction “that is a true Cedar”. C. Deodar happy at Guthrie Smith arboretum. (Belcher). 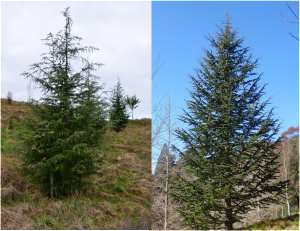 The contrasting form of an 8 year old Deodar, left (Belcher); and a 17 year old Cedrus Atlantica, right (Nott). There are many reasons given for the naming (or misnaming) of various timbers around the world, not the least being that historically when settling in a new country, trees or timber were likened to those of the homeland, or of popular use. Hence in New Zealand’s past we had Red Pine (Rimu), Black Pine (Matai), and White Pine (Kahikatea). This has certainly led to much confusion among saw-millers, timber merchants, trades/craftsmen, retailers, and customers. It also leads to frustration when trying to sell timber – an example, many years ago, an old furniture manufacturer was visiting our property and I showed him a stack of sawn Eucalyptus Obliqua (also known as Tasmanian Oak or Victorian Ash). Cedar is possibly the best example of a collection of different genus heaped together as a timber type. Chris has alluded to a few above, Pencil Cedar, Red Cedar, White Cedar, and Chinese Cedar. To those you can add Incense Cedar (Calocedrus), Port Orford Cedar (Chamaecyparis Lawsoniana) and Yellow Cedar (Xanthocyparis Nootkatensis)! 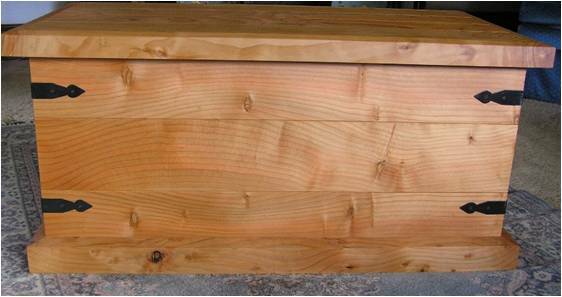 Now to really confuse you, if you were to buy a ‘Cedar Chest’ it is highly likely that it what be made from the wood of the Camphor Laurel (Cinnamomum Camphora), which isn’t even a conifer! 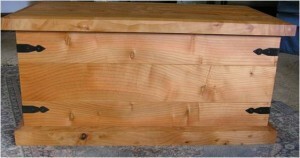 The Cedar you are most likely to find at the local timber store is Western Red Cedar (Thuja Plicata). All three true cedars produce a very similar timber, with pronounced growth rings, drying to a golden brown colour, and distinctly aromatic. It is an ancient timber, famous for temple building in both the Middle East and India. In those areas it has proven incredibly durable, undoubtedly due to slow growth rates due to harsh conditions. 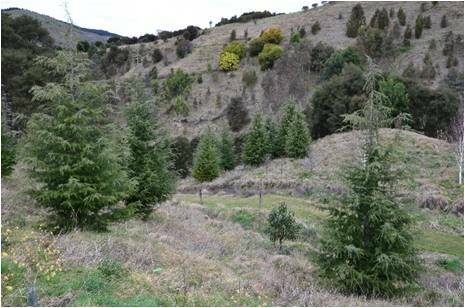 New Zealand grown Cedar (mainly C. Deodar) hasn’t really been tested for durability and, growing as it is in much more favourable conditions, is likely not to prove overly durable. The timber in New Zealand is generally only milled by enthusiasts, and not really available in commercial quantities, although it has be known to be mistaken for Douglas Fir and milled and marketed as such. To be fair, it is similar to Douglas to mill, but the almost over-powering aroma should be the giveaway. Locally, the timber has been used for blanket boxes, furniture, joinery, and in one instance shelves in a linen cupboard (the aroma being a deterrent to moths, silverfish, etc. ).